Most people go on camping or hiking to get deeply in touch with nature, to rest from work, and to take a break from the chaotic urban life. Some of them go for a couple of days; some others take a couple of weeks. However, the fact that they want to escape from the routine does not mean that they will have a hard time. So, in order to avoid that and make the trips easier, people should take with them a few things. For that reason, we have selected what we believe are the best camping gadgets on today’s market. In order to actually enjoy your outdoor activities, you need do a lot of planning. If you do so, you will have a good experience and you will certainly want to repeat it. But you cannot just go into any store and get whatever they offer. In fact, we think that, before you buy any camping gadget, you have to know exactly what the most important characteristics are. Since you will not have access to electricity, you should buy things that work with AA or AAA batteries. Of course, you will have to change them quite often, but you can just pack a bunch of them and use them every time you need it.Also, there are a few products that work using your own physical power – like blenders – that will come in really handy. Not only gadgets, but everything you take on your backpacking and outdoor activities should be portable and light. Why? Remember that you will be carrying it on your back, so too heavy or too big objects might make your walking really unpleasant. Go for collapsible products and light materials, like plastic or carbon fiber. You know what they say, better safe than sorry. The last thing you want to when camping is a bunch of wet and useless stuff, so try your best to find objects that are made of a resistant waterproof material. Nowadays, you can find a fair amount of waterproof products to take to your camping trips – like cameras, bags and even lanterns. Now that you have identified the aspects you should consider when buying gadgets for camping, it is time for us to give you a list with the products we think will be helpful in your upcoming outdoors activities. If you are looking for a durable, lightweight, easy to carry package with the most important tools you need to survive if something bad were to happen while backpacking, the Sol Outdoor Multitool is exactly what you should get. It is a small waterproof case that includes – among other things – fire starters, an emergency sewing and fishing kit, a compass, a folding lock-blade knife and a rescue flash that determines your location up to 20 miles away. The case is so small that you can stick it to your pocket without a problem. The knife is made of steel, so it holds its edge for a long time; the case has some spare area to add a few other things you might want to take on your trips; and the fishing kit has everything you need to survive the unexpected. However, people who have bought this product say that it is too expensive for what you get, since the compass is weak, it is not protected accordingly and it requires a very flat surface to work properly; the needles, hook and fishing line are not strong enough to get the job done; and the case tends to leak a little. Some people also say that, since pretty much everything is made of plastic, the pieces break easily after a short period of time. Related: If you are looking for a sleeping bag, then the Survive Outdoors Longer Escape Bivvy is what we recommend. It is made of a strong, waterresistant material that will keep you warm and dry for a long period of time. 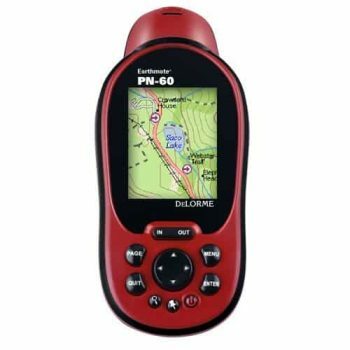 When people ask us about what GPS they should get for their outdoor activities, we always recommend them the DeLorme Earthmate PN-60 GPS. It offers a 3.5 GB of user-available flash memory where you can save waypoints, routes, tracks and geocaches and it can estimate potential weather changes due to its barometric altimeter. Users have said that it is extremely accurate when it comes to pinpoint your position. It also displays NOAA nautical charts to make easier your coastal sailing and kayaking; it has a text completion system; and a long battery life. Among the most important negative aspects that this product has, you can find that the maps files are rather large, so you would need a memory card with loads of space. Additionally, the GPS sometimes takes too long on recalculating routes because the processor is quite slow. Finally, some buyers have stated that the product will not connect with computers with Windows 8; and that it does not have any good instructions, not even on the Internet, so they had to figure everything out by themselves. Related: We also recommend you to get this GPS’ best partner: the DeLorme Earthmate PN Series In-Vehicle Mount. It provides a strong suction cup for a secure hold and an easy release, it is sturdy and you can even use it on boats! 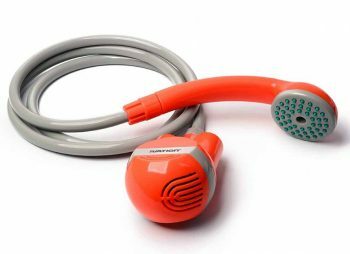 For those who like to have proper showers even when camping, we recommend the Ivation Portable Outdoor Shower. Basically, the bottom edge draws water from a bucket, cleans it with its filtration system, and sends it to the upper edge, which gives you a constant shower stream for enough time to get yourself clean wherever you are. We consider that one of its best features is that you can charge it via USB and, when fully charged, it works for 1 hour. With a 5 gallon bucket of water, you can get around 12 minutes of continuous use, which is plenty of time to take a decent shower. Also, you do not have to use your hands to hold it while bathing since the head has a suction cup support to stick it to any flat surface. Unfortunately, a few users say that the pump does not have enough pressure to draw water from the bucket. Some others say that, when you cut the water flow between rinses, re-establishing the stream takes too long. Additionally, they affirmed that the motor area is not protected from the water, which accelerates the rusting process; and that the on-off button gets stuck quite often, making you waste a lot of water. Related: We strongly recommend the Ivation Vacuum Sealer for Food Preservation for every single hiking trip you do. With it, you would not have to worry about rotten vegetables or decomposed food since it will help you preserve your meals as long as you need it. Usually, if you want to have a lantern for your camping trips, you buy the ones that work with gas or any other kind of oil. This, of course, might be dangerous if you are not cautious enough. 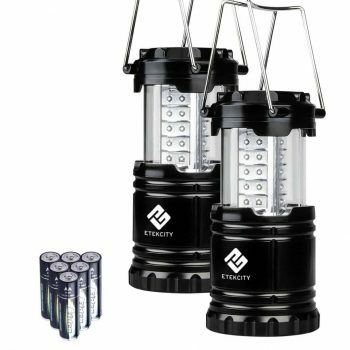 However, Etekcity Portable LED Camping Lantern uses AA batteries to give you continuous light. It is made with a military grade plastic, which gives you a long-time durability; it is not as big as gas lanterns and can be collapsed to a smaller size to transport it; and it illuminates a reasonable area to help you move in the dark. Nevertheless, it is so lightweight that if you hang it to a tree limb or any other surface, the wind might throw it to the floor. Also, it does not have a light diffuser, making the light blue and with an intense and unpleasant glare. One of its major downsides is that the batteries do not last as much as the description says. According to the product, it lasts “up to 12 hours”, but users stated that it only goes on for 4 hours top. Related: While camping, the Etekcity Knife Sharpener is what we recommend you to use when your knives lose their edge because it is safe, it is easy to use and you can sharpen kitchen, fishing, hunting and pocket knives. 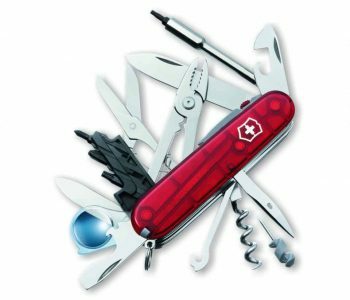 We believe that the Victorinox Cybertool Lite Multi Tool is a must have when it comes to camping and backpacking. This version of the most famous brand of pocket knives has 34 different tools that will be helpful more than once. It is compact, strong and is made of first-class stainless steel, which guarantees very durable tools. Blades, screwdrivers, bottle opener, scissors and a LED flashlight are just a few of the implements it has in it. Long story short, this “pocket knife” brings all you might need in outdoor, indoor or any daily activity. Some users have said, however, that the scissors tends to go sideways when cutting something too heavy. They also affirmed that the flashlight turns on while it is in your pocket, killing the batteries and that you have to make sure the screwdriver tips are attached firmly. Related: Since you will be carrying a bunch of things, you will definitely need a strong backpack to put them all in, right? Well, we recommend the Victorinox VX Sport Scout Backpack. It is made of nylon, it is really durable and comfortable. Specific features: Charge your gadgets; no oil – just renewable resources. As you might know, carrying a propane tank every time you go camping is not the best idea. It is not safe and it is not certainly light either. So, in those cases, you should definitely have the BioLite Wood Burning Campstove. It is small and lightweight, it is easy to use, and it works with the tree branches you gather on the trail. 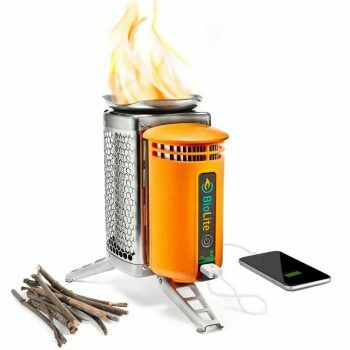 Even though it can boil 1 liter of water in just five minutes, its best characteristic is that it converts the heat produced by burning twigs into usable electricity, so you can plug your phone or any other device in and the stove will charge it; as simple as that. According to buyers, one of its most bothersome problems is that you have to feed the flames constantly, making the cooking process really difficult. Also, they say that you should avoid breezy conditions since the fire is not strong enough to resist wind blows. It still has an important weakness: it charges really slowly. In fact, users say that it only charged 9% of a Smartphone’s battery in one hour during full burn. Related: We also recommend you to get the BioLite Kettle Pot to take along with the stove. It is made of stainless steel; you can use it to cook and even to prepare coffee! 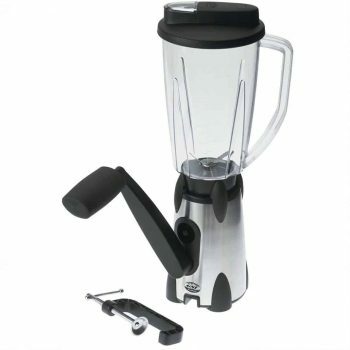 For those who are looking for a way to prepare smoothies while camping, we recommend the GSI Outdoors Vortex Blender. It is a cord and battery free blender that works perfectly for tailgating and family reunions anywhere there is no access to electricity. All you have to do is using your own power to move the hand crank. Its pitcher is made of a sturdy BPA free resin that guarantees a long-lasting blender. Also, it has a C-clamp base to secure it to the table; its jug holds up to 1.5 litters; and it is a really useful tool to crush ice or blend drinks. However, people who have bought this product say that it is not powerful enough to blend or crush ice and that it just chops ingredients and mixes them together, leaving large pieces of fruits or vegetables instead of making a proper drink. Additionally, they say that the metallic parts are not well-protected against corrosion, so it might not last long. Finally, they affirm that you need to have a pretty strong arm to use it for a long period of time, since the movement is not as smooth as it should be. Related: If you are a coffee lover, then you should get the GSI Outdoors Drip Coffee Maker. It will give you fresh brewed coffee on the trail, it is really lightweight, and it fits nearly with any mug. 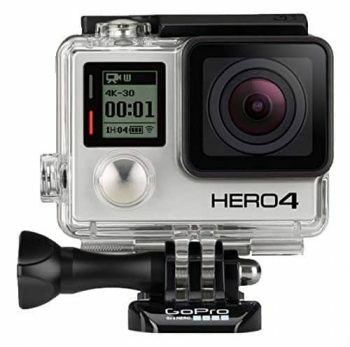 If you like to record everything you do while hiking, backpacking or fishing, the GoPro HERO4 is the camera you should buy. It offers high resolution video 4K30 and 2.7K60 – with a super slow motion mode, 240 frames per second. Basically, it gives you sharp, rich and detailed images in a small, portable and waterproof camera. One of its best features is that you can connect it to your Smartphone via Wi-Fi or Bluetooth to transfer and manage your photos and videos. Also, since it is made of a shockproof material, it is quite durable and resistant to typical hiking and kayaking hits. Nevertheless, users have affirmed that it tends to freeze up after a few minutes recording at 1080 p 30 fps resolution. Also, they said that it gets pretty warm when shooting in 4 K mode and that the battery life does not last long while Wi-Fi is running. Finally, this camera does not have a screen to look what you have recorded. The only way to see if it is doing it fine is by connecting it to the GoPro app via Wi-Fi, which – as we previously read – consumes the battery really fast. Related: The perfect accessory for this camera would be the GoPro 3-Way Grip, Arm and Tripod. It is so versatile that you can use it as a camera grip, as an extension arm or as a tripod. Thanks to the information mentioned before, you are aware that you should select compact and lightweight gadgets to make its transportation easier; that you have to pick the ones that does not require electric power to work; and that you have to do your best in finding waterproof objects. Also, you have a list with products we recommend for your next camping trip, their description and its pros and cons. Have you ever used one of the products from our list? How did it work for you? Is there any other camp gadgets that you would recommend? Share with us what you think in the comments!